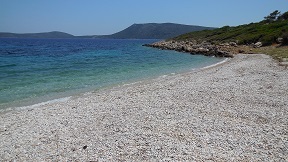 The beach of Glyfa on the island of Alonissos in Greece, information and pictures. 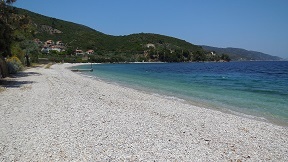 If you are staying in an accommodation in Steni Vala than Glyfa Beach is the nearest beach for swimming and a place where you can find water sports etc. 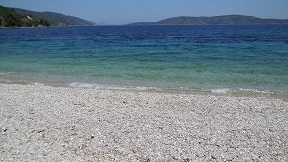 It is situated at the north side of Stena Vala at a distance of about 12 kilometer from Patitiri. 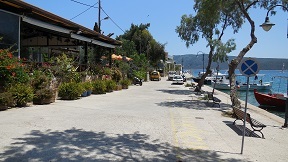 In the nearby village there are hotels, tavernas, mini markets and a camp site. 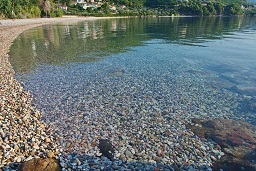 Glyfa beach is a quite a large beach with sand and some small pebbles, and with clear sea water. You can reach this beach by car. 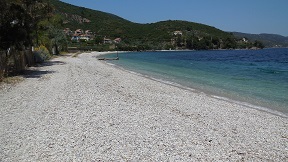 There is a large parking close to the beach. There is also a bus service from Patitiri to Glyfa Beach and the journey takes about 20 minutes. 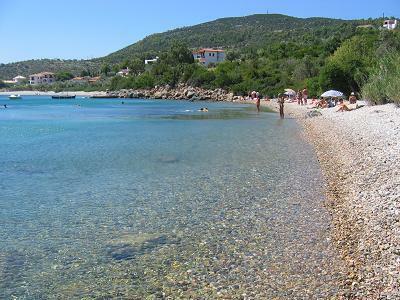 The surroundings of the beach are green and it is not overcrowded yet. 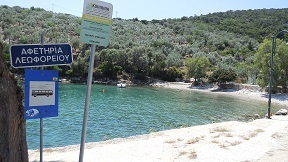 At the beach there are a couple of tavernas and you can rent sunbeds and umbrellas here. 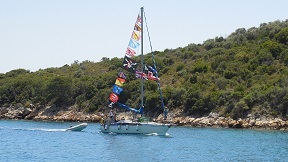 During the high season there are sometimes also small excursion boats or taxi boats that can take you to other beaches in the surrounding area and to the nearby islands of Alonissos.